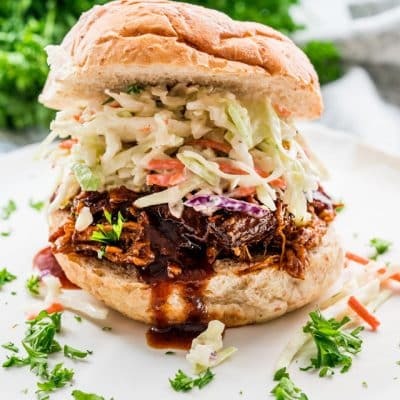 Easy and quick Instant Pot BBQ Pulled Pork done in a fraction of the usual time. 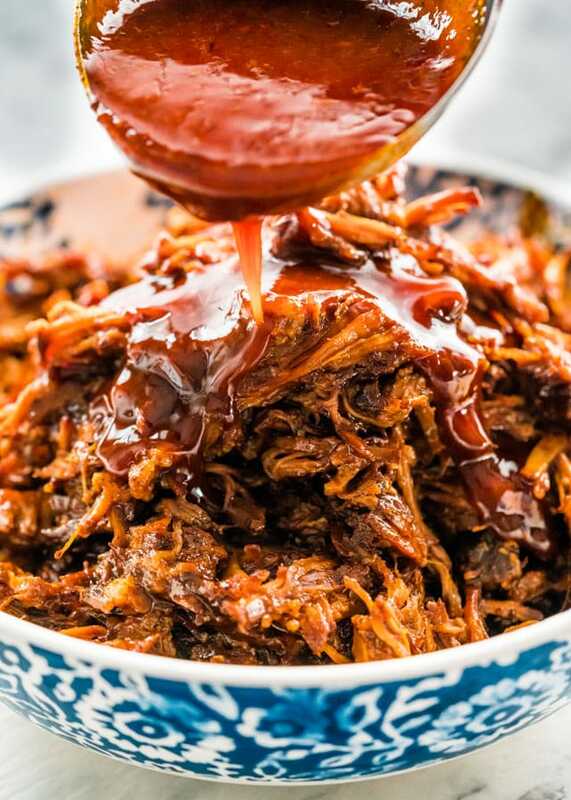 Juicy pork shoulder cooked in the most delicious BBQ sauce and loaded with tons of flavor. Perfect for a busy weeknight or your holiday entertaining. Am I late to the Instant Pot party? Because I seriously love this incredible appliance. We just got one a couple weeks ago and I finally used it. I knew my first recipe had to be special and nothing like a good old BBQ pulled pork recipe to start things off right. I love this magical pot. It’s all in one, I can now throw away my slow cooker because this Instant Pot does it all. I’m seriously impressed. It’s a pressure cooker, a slow cooker, rice cooker, steamer, etc all in one. I bought the 6qt because this one is more than enough for what I need but they do come in 3 sizes, 3qt, 6qt and 8qt. Anyway, it’s a great new gadget in my kitchen, so I hope I’ll be getting some use out of it. But let’s talk pulled pork, shall we? It’s the best! That pretty much sums it up. First of all, to get the perfect, juicy pulled pork, you must use the right meat and that is pork shoulder. If you use a different type of meat cut your pulled pork will be tough and will dry out, but pork shoulder becomes incredibly tender and tasty whether you slow cook it or cook it in a pressure cooker. I first make a dry rub for this for that extra flavor. To avoid the dry rub rinsing away as you cook the pork in the sauce, I first sear it, also in the Instant Pot, until the meat is browned and this ensures that the rub is going to stay firm and lock in those amazing flavors. Trust me, you must sear your meat first. Which is why I love this Instant Pot even more, because it’s all done in the same pot. While the total time for this recipe is a little over 2 hours, I still call this recipe pretty quick as far as pulled pork goes. 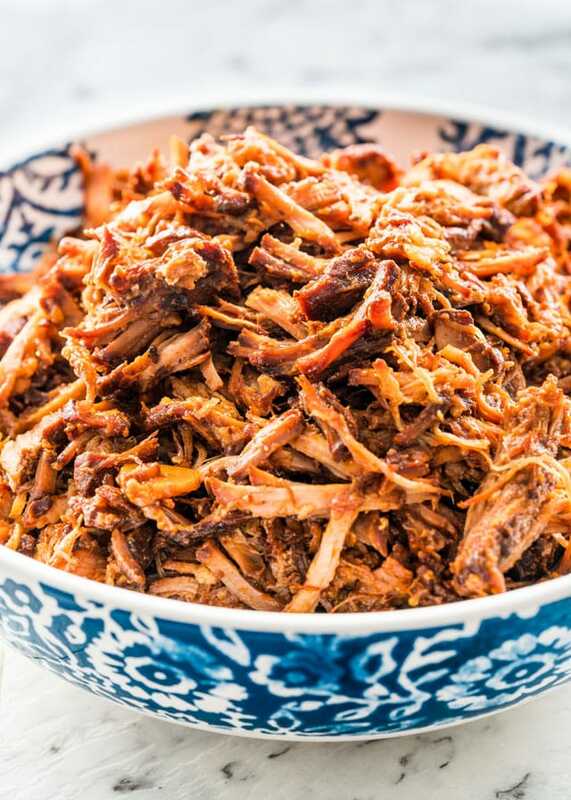 Pulled pork when cooked in a slow cooker or at a low temperature in your oven can take up to 12 hours before it’s tender enough to shred, which is why this Instant pot is great, because in 2 hours and 20 minutes you have yourself juicy and delicious pulled pork. For the longest time I used to be afraid to use a pressure cooker, which I have used before, a very long time ago, but I can’t deny the advantages, especially for cooking meat. The Instant pot doesn’t seem so scary, but I still strongly recommend to you guys to read the manufacturer’s guide on how to use it before attempting this recipe. That’s all I have to say regarding that, because this pulled pork is a MUST! When you're browning the pork or reducing the sauce, DO NOT put the lid on the instant pot. Nutritional information does not include dinner rolls and/or coleslaw. Made this today and I went back for seconds! Usually I find pulled pork recipes too tangy or too sweet. This one has a nice balance of flavours. Thank you for this recipe! My husband was really leery about trying this recipe as my attempts with a crock pot turned out too dry and smoky. This recipe is simply amazing and he is asking me to cook another big batch!! I’m so happy to hear this, so glad you guys enjoy the recipe! Both of my spoiled, ridiculously picky sons loved this. Thank you so much for this recipe. I will be following you from here on out! I have one pointer to pass along. This was the very first meal I prepared using my brand new instant pot, so I guess I needed to learn some tricks. I had a minor issue. After browning the meat and starting the pressure cooking cycle, my Instant Pot wouldn’t build the necessary pressure, and I got the “burn” signal. So, I added water, which fixed the problem, but which I think was the wrong thing to do because the sauce was then way too runny. I think I just needed to clear the browned bits off the bottom of the pot with a light deglaze before adding all the meat back in. I’ll try that next time. In spite of the self-induced runny sauce, this recipe was a major hit with my family. Hi Jo! Doubling this recipe and making a few days before our church potluck. How long will it take to reheat? Thank you for your reply! It depends on your reheating method. Also depends if you’re freezing the food or refrigerating. Thank you for replying. I should have added: We’d plan on reheating in the IP. How long do you think that would take and on what setting? Thinking we should probably use two IPs to cook and reheat!! I would just do 3 minutes in the IP if it’s not frozen. 10 minutes if it is. Make sure to add extra liquid to the pot when reheating so that the steam can build up! You can cook it down after or add a cornstarch slurry to thicken it. Definitely do it in batches, I’ve had my IP shoot hot broth at me while releasing pressure for being too full. Thank you NIcole! As it turned out we prepped and got it ready for the next day. Cooked in the morning and served for lunch. One step serving which saved a lot of time. First time I have made pulled pork, it was great thank you. Had burn alert issue once, not a problem. It came out excellent! Honey makes a big difference . Best recipe ever! It happens sometimes, we learned that adding a touch more liquid helps with the burn alert! We’re so glad you like the recipe. Have you had the issue of the burn warning coming up? I didn’t read the comment suggesting to deglaze the pot until after and I’m worried it’ll come out burnt tasting. Should I stop and check the bottom or just let it cook? Thanks! As long as you have some liquid in there it’ll be fine, no burnt taste. That’s more when the bottom of the pot just gets a bit too hot. Yum, this looks great! I have two questions. How many does this serve? I’m thinking of making it for a party st my house, hosting about 10 people. If I needed to make extra, do I need to increase the cook time? 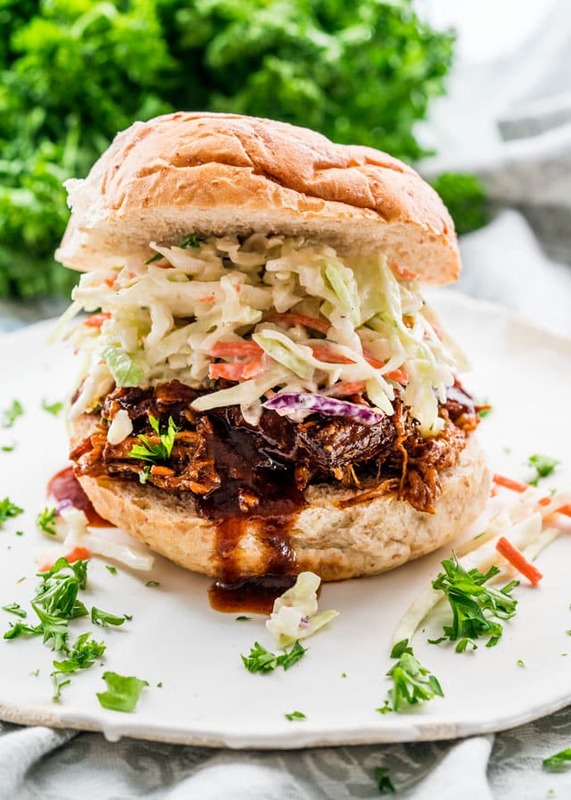 Second, do you have a slaw recipe that you recommend on top of this pork on sandwiches? Thanks so much in advance! This will comfortably serve 8 people. If you hover your cursor over the number of servings in the recipe card, you can adjust for how many people are eating. The amounts called for in the recipe will adjust themselves for you. Feel free to use the coleslaw recipe used for this post! Very tasty and super easy, thanks for a great recipe. I made this for our Fourth of July party yesterday, and it was a huge hit. Thanks for an amazingly delicious and easy recipe. This is the third time we have made this recipe! We love it. Thank you. Made this last night…we loved it! I would definitely try harder to remove as much visible fat as possible before cooking next time. I also found it needed just a bit more salt, but it only took 15 min to reduce the sauce…just need to remind folks that once it starts to reduce you need to watch it like a hawk as it reduces very quickly after that! We had it again tonight and I have to say it’s possibly a teeny tiny bit better the second time around! Can I ask how you reheated it the second day. I want to make this but have a time crunch so thought of making the day before and reheating. This would reheat just fine in the microwave, or you could heat it up on the stove. Made the pork for dinner tonight. So yummy! The only problem I had was getting the sauce to thicken. I boiled for about 10 min and it was still really runny with no sign of getting thicker. Any tips for next time? If you want the sauce to thicken faster, you can always make a cornstarch slurry with 1 tsp corn starch and a splash of water! Whisk in well while sauce boils and it should thicken right away. Just cleaned up after making this recipe. Oh, it was soooo good, just the right bite and the meat shredded to perfection. Just one remark about the recipe. After I browned two batches of pork, the pot was pretty dark with the braised drippings. Before returning the meat to the pot, I deglazed with a little chicken broth to capture all that rich flavor and to prevent the “burn” warning from getting grouchy. Thanks for the recipe. It was so good, I wanted to immediately call friends to come have dinner with us. Was just wonderful! Cooked my 4lbs of pork on meat/stew “More” (high) for 90 min. It did fall right off the bone, which I was worried about bc past Instant Pot recipes left the meat more “chunky” rather than shredded. Kids loved it too! I must bought a pork shoulder but it has the bone?? I made this with a leaner pork. I made it with boneless porkchops, it came out delicious. I preassure cooked it for 10 min. I loved it! I love to cook and the instant pot is one of the best investments ever!